Bone weakness can be a manifestation of inadequate or absence of critical bone nutrients, absorption interference or insufficient skeletal use (sedentary lifestyle). Bone loss conditions include osteoporosis, osteopenia, poor dental health, loss of height over time, bone pain, or stiffness in muscles and joints. Bone health is not as simple as supplementing extra calcium! Have you ever noticed levels of osteoporosis continue to rise despite high rates of calcium supplementation? With single-minded focus on calcium for bones, many overlook the importance of other minerals, vitamins, proteins and fats. a. The Paleo Diet focuses on abundant vegetables which not only supply ample calcium, but also magnesium, phosphorus, boron and other trace minerals. b. Using bone broth as a staple food provides hard-to-attain collagen and glucosamine proteins, both of which are crucial to building bone matrix (in the workbook, Cooking 'Assignment' #1 is bone broth; benefits and techniques detailed in Prep Section F). c. Emphasis on naturally fatty foods, such as pasture-raised animal products or sardines, supply necessary EPA and DHA omega-3 fats for bone marrow integrity, as well as fat-soluble vitamins K2 and D3 for proper calcium metabolism. Paleo removes grains and legumes which contain antinutrients. These mineral ‘traps’ effectively prevent the body from absorbing critical bone-building minerals within the digestive tract, most notably phosphorus, magnesium, zinc, iron and calcium. The little-known, fat-soluble vitamin K2 is responsible for collecting calcium that was incorrectly deposited in soft tissue (think arteries, joint padding, kidney stones) and properly redirecting it into the bone structure. Unfortunately, modern factory-farming practices have bred K2 out of conventional animal products. Paleo emphasizes traditional foods that naturally supply vitamin K2. These include fatty products from animals raised in their natural environment, eating their natural diet: grass-fed butter and cheese, pasture-raised egg yolks or organ meats, and even sardines. Bone needs to be stressed to encourage the body to reinforce and strengthen skeletal structure. The Paleo Lifestyle encourages functional movements and exercise (typical of our ancestors’ normal activities) to effectively stimulate bone integrity. 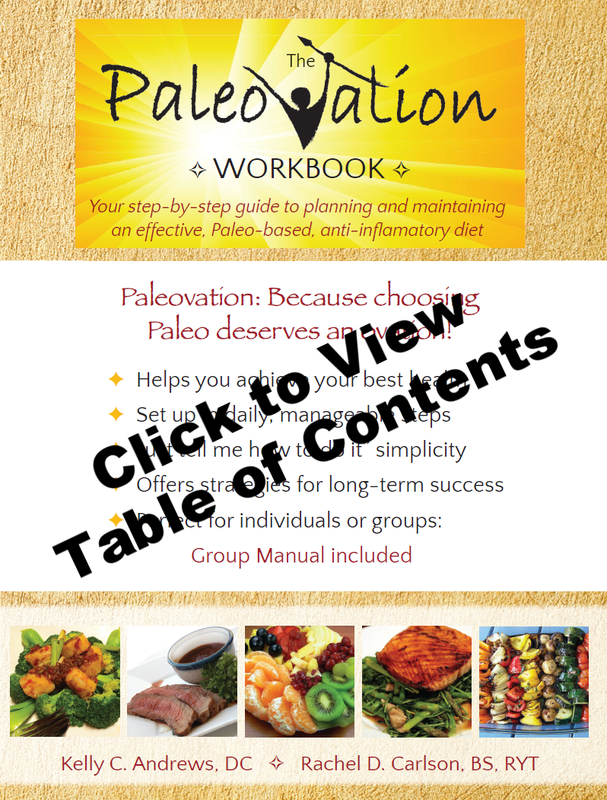 Many suggestions, from beginner to advanced, are outlined in The Paleovation Workbook. Stress causes an elevation in cortisol which not only interferes with bone-building, but actively encourages bone breakdown! Paleo substantially reduces digestive stress and cortisol levels by focusing on anti-inflammatory and easy-to-digest foods. Stress-reducing lifestyle techniques are equally addressed. Can I get calcium without dairy? Consider this: Where does a grass-fed cow get her calcium? From milk? Nope, from her natural diet of grass. Likewise, humans can meet calcium needs within their natural diet of hunter-gatherer foods. Note: Yes, calcium is the most prominent mineral in bones so many are concerned about removing dairy from the diet. The Paleovation Workbook thoroughly explains non-dairy calcium sources along with strategies to improve calcium absorption and ensure it is deposited in the bones (Days 7 & 16). Individuals new to Paleo often appreciate assistance identifying typical inflammatory foods, sifting through abundant Paleo resources, finding easy-to-understand information and staying prepared. This is the basis of The Paleovation Workbook: It’s like having a trusted mentor supporting the reader each day.